Actually, before sitting down for writing this post, I had just hung up the phone, finished a very unpleasant ‘discussion’ with a taxi company; the taxi driver charged 50% more than what we would normally pay. I am sorry if this start of the post makes you frown, but what I really want to tell you are two things from this incidents: one is … Can you believe how much the English ‘way of complaining’ and the ‘politeness’ (especially during the complain process) influenced me? Ha… I had never been a person who could calmly and politely discuss or complain, but after living in England for such a long long time, I started talking in English way with enormous ‘could you’, ‘please’, ‘if you don’t mind’, ‘sorry..’, ‘thank you’… even when I was in such horrible rage… ha…When I realize how much I changed, I just could not stop laughing, ok, forgive the taxi driver. And the second thing is that if you were there listening to me, you would be so surprised to hear my ‘Mancunian accent’ coming out, where normally it has become much much milder nowadays. But, now when I am trying to rush words out, they are all in Mancunian accent. Ha… After living in Manchester for many years, I never thought one day if I leave, I would carry so much from Manchester to the next destination, but, now, I know something inside me, something I got from years of living in Manchester, still unintentionally kept in me, and not just the accent… I guess, it does not matter how much I liked or hated Manchester, one thing can never be changed, the time and memory have long become part of my life, part of me. It was my second home town. Some friends have asked me to post more Chinese meat dishes… Well, one reason is that I don’t normally eat lots of meat, another reason is I am a bit lazy… ok, quite lazy. Some traditional meat dishes in northeast Chinese cuisine take way longer to make than just simple stir fried vegetables. Hey, but saying that, the other day I was checking up some Western recipes and I stumbled upon a site teaching you how to make a three course ‘Wednesday’ French dinner. Just the main course takes two hours and half to make already. 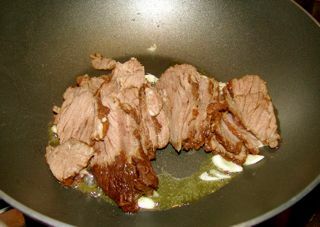 — This dish, cooking beef strips, for example, takes, I would say 2 hours, still shorter than the French meal. So, ok, I am just lazy. However, the good thing about taking time to ‘boil’ the meat is that then you are actually preparing for many dishes. 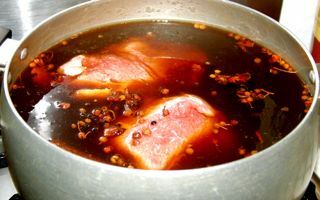 :) You see, if you prepare quite a large chuck of meat, it can be cooked into many different recipes from there, and the soup for boiling the meat can be great ‘stock’ for further cooking as well. — Ha… it is definitely the main motivation for me to make it. Another motivation is — of course, the irresistible taste. 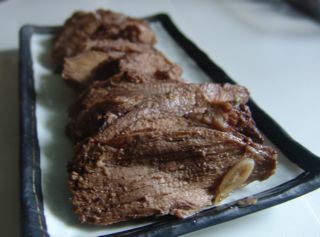 Anyway, in this post, I think I am only going to talk about this one – cooking ‘beef slices’ recipe. Although you can have it in many different regions in China, it is really one of the ‘signature’ dishes for ‘Hui’ ethnic group. In Chinese, this dish is called ‘Pa Rou Tiao’. ‘Pa’ here is a way of cooking, in many menus in Chinese restaurants is translated as ‘article’. Strictly speaking, it is not a ‘stir fried’ dish, rather chopping the meat into slices, then ‘slow’ cooking it in the sauce. ‘Rou tiao’ means meat strips. 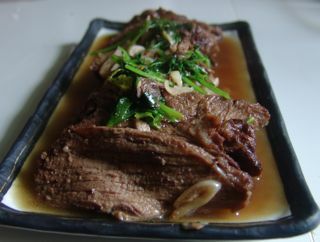 The beef, however, is not really chopped into strips, rather, it is sliced into very thin slices. 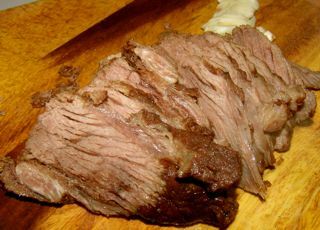 After cooking, the meat is supposed to be super soft, and almost ‘melt’ in the mouth, a bit ‘wet’, with all the seasonings. There are many ways of making it, this is ‘my’ way, more ‘safe’ way, the taste and texture can never be too wrong. 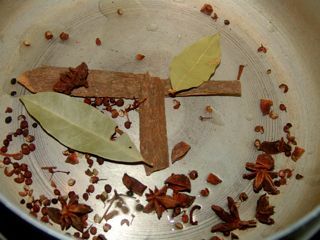 1) Boiling the beef chunck (without chopping into small pieces) in low fire with a small handful sichuan peppercorn, 2/3 bay leaves, a small handful anise star, couple of cinnamon stick, 2 tablespoons of salt, two tablespoons of light soy sauce (in the picture I used dark soy sauce, since we run out off light one. The colour should not be too dark.) It normally takes around 1 1/2 hours to get the beef very soft and with the seasoning ‘soaking in’. 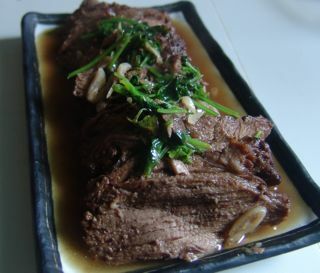 1) Chop well boiled beef into thin slices. 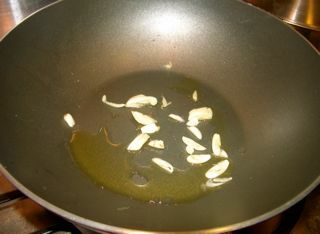 2) In a heated wok, pour in around 1 tablespoon of oil (for the plate shown in the picture). 3) When the oil is hot enough, add in chopped garlic. 4) When the smell of the garlic comes out, add in chopped beef slices in the wok. 5) Add in 1 small tablespoon of cooking wine to the wok. 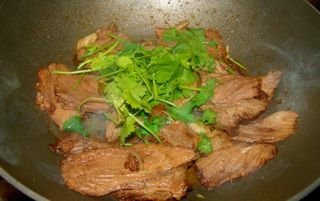 6) Add in one ladle sauce from the boiling sauce pan to the wok, and a small bunch of coriander. 7) Keep the fire low, keep on cooking for further 5 minutes. 8) Add in corn flour mix (with water for thickening the sauce). It is good to go with plain white rice or beer.